This Emerald diamond is 0.31 carat in weight, and comes with Good polish and Fair symmetry, as verified from an independent gemological laboratory. The diamond is graded D in colour, and has a clarity grade of SI1. The diamond's GIA grading report number is 6193495902, which will detail further its specifications and measurements, and will also come with the purchase of the stone. AUD 2,204 Excl. Duties / Taxes. This Emerald diamond is 0.45 carat in weight, and comes with Good polish and Very Good symmetry, as verified from an independent gemological laboratory. The diamond is graded G in colour, and has a clarity grade of VVS1. The diamond's GIA grading report number is 1123338848, which will detail further its specifications and measurements, and will also come with the purchase of the stone. This Emerald diamond is 0.3 carat in weight, and comes with Good polish and Very Good symmetry, as verified from an independent gemological laboratory. The diamond is graded D in colour, and has a clarity grade of VS1. The diamond's GIA grading report number is 7308364894, which will detail further its specifications and measurements, and will also come with the purchase of the stone. AUD 2,431 Excl. Duties / Taxes. This Emerald diamond is 0.7 carat in weight, and comes with Good polish and Good symmetry, as verified from an independent gemological laboratory. The diamond is graded G in colour, and has a clarity grade of SI1. The diamond's GIA grading report number is 2171265421, which will detail further its specifications and measurements, and will also come with the purchase of the stone. This Emerald diamond is 1.01 carat in weight, and comes with Good polish and Fair symmetry, as verified from an independent gemological laboratory. The diamond is graded D in colour, and has a clarity grade of SI1. The diamond's GIA grading report number is 2185779712, which will detail further its specifications and measurements, and will also come with the purchase of the stone. This Emerald diamond is 0.5 carat in weight, and comes with Good polish and Very Good symmetry, as verified from an independent gemological laboratory. The diamond is graded F in colour, and has a clarity grade of SI1. The diamond's GIA grading report number is 2161466093, which will detail further its specifications and measurements, and will also come with the purchase of the stone. This Emerald diamond is 1.02 carat in weight, and comes with Good polish and Good symmetry, as verified from an independent gemological laboratory. The diamond is graded E in colour, and has a clarity grade of SI1. The diamond's GIA grading report number is 2205070544, which will detail further its specifications and measurements, and will also come with the purchase of the stone. This Emerald diamond is 0.45 carat in weight, and comes with Good polish and Good symmetry, as verified from an independent gemological laboratory. The diamond is graded D in colour, and has a clarity grade of SI1. The diamond's GIA grading report number is 1196392307, which will detail further its specifications and measurements, and will also come with the purchase of the stone. This Emerald diamond is 0.7 carat in weight, and comes with Good polish and Fair symmetry, as verified from an independent gemological laboratory. The diamond is graded H in colour, and has a clarity grade of VVS2. The diamond's GIA grading report number is 6187276341, which will detail further its specifications and measurements, and will also come with the purchase of the stone. This Emerald diamond is 1.01 carat in weight, and comes with Good polish and Good symmetry, as verified from an independent gemological laboratory. 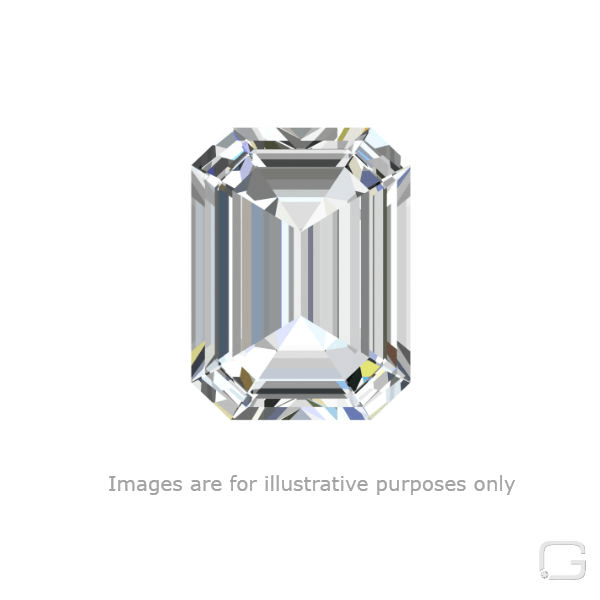 The diamond is graded G in colour, and has a clarity grade of VVS2. The diamond's GIA grading report number is 5201174180, which will detail further its specifications and measurements, and will also come with the purchase of the stone. This Emerald diamond is 0.91 carat in weight, and comes with Good polish and Good symmetry, as verified from an independent gemological laboratory. The diamond is graded F in colour, and has a clarity grade of VVS2. The diamond's GIA grading report number is 10371560, which will detail further its specifications and measurements, and will also come with the purchase of the stone. AUD 4,793 Excl. Duties / Taxes. This Emerald diamond is 0.95 carat in weight, and comes with Good polish and Good symmetry, as verified from an independent gemological laboratory. The diamond is graded H in colour, and has a clarity grade of VVS2. The diamond's GIA grading report number is 6173327969, which will detail further its specifications and measurements, and will also come with the purchase of the stone.